A Nomination, a Meme, and a Quandary--Oh My! A while back, garden girl kindly nominated me for an Arte y Pico award for art and creativity in blogging. It was a treat to be thought of in this light, especially since I've been feeling anything but artsy or creative lately. To be honest, I've been feeling like a washed up Hausfrau run over by a colorful expression and left rumpled at the side of the road, too tired to move. Thanks, Linda, for the pick-me-up! VP of Veg Plotting (I've always loved this name because I imagine a turnip wearing a black mask and a carrot wearing a stocking over its head, both sneaking around in the dark with flashlights in, say, a vegetable soup factory, rescuing their own kind... Get it, vegetables plotting?! Oh, never mind!) tagged me to a play a Six Random Facts meme, which tickled my fancy. It was fun learning six things about VP, and I'd like to learn six things about some other bloggers, too! 1. I didn't speak a word of English when I started kindergarten. I remember the other kids were singing songs and making hand motions and I just followed along, even though I thought the whole thing a bit odd. I don't subsequently remember the process of learning English, so it must not have been difficult. 2. I've never had a broken bone (knock wood!). 3. When I was in high school, I was enamored of Carl Sagan. He showed me a universe beyond the small town I grew up in, and instilled in me a lifelong love of science. I secretly thought of him as my "Uncle Carl." 4. I'm organized and logical, and I have an inquisitive mind. Despite my appreciation of science, it could never have been my career as my brain doesn't work that way academically. What can I say. I'm a word geek. 5. I'm kind of disgruntled living in Michigan and often daydream about moving somewhere more geographically interesting, not as humid, less economically depressed, and whose main industry is not automotive manufacturing. At the same time, my life is here and I don't know if I'd have the courage to move somewhere I'd know no one. 6. I once created a garden for cats who lived at a no-kill cat shelter. I researched all the plants, designed and planted the garden, and maintained it until a few years back when the property was sold. This was the most rewarding volunteer project I have ever done, and I think the garden was unique to Michigan. All the cats enjoyed going outside, but Onyx was my most loyal companion, especially as I was planting the garden. Thank you so much for your nomination. I had a post at 11.12.07 "I' ve been tagged by Vero". There can you read something about my person. I think, I' m not so interesting to write more of myself in this short interval. But many thanks for thinking at me! Your heart speaks volumes reading that you designed this wonderful cat garden project! I did go look at the link and you did a wonderful job! No clue what the flowers are. I would have guessed Penstemon too. How odd that you've never broken a bone! I've broken only weird ones, like toes, fingers & collarbone. I love the cat garden idea. How lucky they were to have you make that for them. I love your idea with the cat garden. Did the cats there get to go out actually? Hello Monica, herzlichen Glückwunsch zum Award, auch wenn ich nicht so sehr viel von dieser Art Awards halte. Meistens ist es nur Eigenwerbung. Aber jeder sollte selbst wissen, wie er damit umgeht. Der 6. September? Surprise ! Surprise ! ;-)). Lass Dich überraschen. What language did you speak then when you started kindergarden? The foliage almost looks like lupine foliage but not the flowers. They kind of look like some kind of bell flower. Not sure. Good luck! I guess I was "a day late and a dollar short" with the random facts meme in that many of the people I'd tagged had already done such a post before I started reading their blogs (Hi Wurzerl! Hi Lisa!). Timing has never been my strong suit. Seriously. Bek, yes the cats went outside. The area had a tall chainlink fence with two feet of mesh on top that faced diagonally inward--the cats couldn't jump the fence that way, and none of them wanted to. There were two cat flaps in the house so they could go out at will. You can see photos and read articles about the place from here. I plan on writing a blog entry about my experience there, with photos, later as well. Tina, I spoke German before I started kindergarten (and barely still do!). Believe it or not, at the time (late 1960s), Chrysler was advertising in European newspapers for skilled tradesmen since after the riots in Detroit about the same time, they were having difficulty attracting people from the U.S. to work in non-lineworker positions in the factories! My parents didn't know from Detroit, but found out fast! 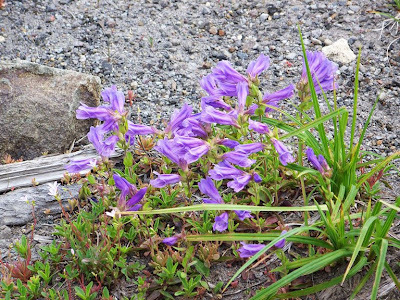 All, a botanist friend of a friend confirmed the Mount St Helens plant is a penstemon, but I still have no idea what species. German! Wow! I love Germany and am glad you can still speak it a bit. Ich habe mir gerade die Fotos vom Katzengarten angeschaut und bin ganz begeistert davon. Schade, dass das Grundstueck verkauft worden ist. I'm Esther Montgomery's next door neighbour. You left her a tag but she's on Mars which makes it difficult for her to respond so she asked me to take it up instead. Hope you don't mind us arranging it this way. Monica, the cat garden is wonderful. What a great thing to donate your time for. Cats and gardens go together. I can't wait to read more about it in your blog. Lovely post Monica - thanks for taking up the tag! I love your description of what you imagine's happening with my blog title - hee hee! I might have to 'borrow' that (with a link to you of course) for a what's in a name? piece I'm planning. Is that OK? And I love the fact you designed a garden for cats. Our 2 are nodding with approval on that one. They adore catnip BTW - they're asking if you put plenty in your design?